All you have to do to enter is leave a comment using the rafflecopter form below and there are additional entries too if so you desire! Entries close 1st October 2012. Lovely fabric. I would make great borders on a cushion or a bag. So cute. I love cross stitching so this really hits home. What gorgeous fabric, I've never seen this before! Love the fabric! Thanks for the chance to win something awesome!! Love stitcheries! I can watch TV in the evening and hang out with hubby too. Thanks for a chance. I learned how to cross stitch in very similar printed fabric, as a child. My mother bought some for me and my sister, and I remember thinking why to stitch if the fabric was already printed with a design, it seemed not to be needed! Oh my gosh..what fab fabric!! So pretty! I'm working on a cross stitch project now...so relaxing. Here we are just starting fall. The garden is slowing down. I know! I can't belive October is almost here. I need to get going on some birthday and christmas gifts. Love these! I haven't seen them anywhere. I wish we were heading into spring, but alas, it's cold weather coming for us! I love the dandelion flowers on the fabric!! Those are beautiful! I just recently picked up a Lecien print of a cross stitch alphabet. I wonder if cross stitch prints will be the next trend? I love these cross-stitch prints. Actually, I love all cross-stitch prints! LOL! These are new to me, and they're adorable. Oh, what lovely FQ's. My mother is a X-stitch Queen and I just cannot get it right. So I would make something with this for my craft room to remind me of her - we live 2000km away from each other. The cross stitch fabrics are so pretty. Thanks for the giveaway. I already know what I would make with these! The cross-stitch fabric is very cute! I enjoy the old fashioned cross stitch and embroidery. Thank you for a chance to win. Great fabric, thanks for the chance to win it. Great giveaway! Love the cross stitch fabric. It has been a very long time since I have done any sort of cross stitch. When I was a little girl, I used to watch my mother working on pieces in the evenings. here is almost autumn and school starts tomorrow! Love the fabric! Yes it seems like it was just the beginning of my pregnancy and now it is almost the end. I am due next month! Thank youfor the awesome giveaway! I have a new granddaughter. I am thinking these fat quarters will come in very handy!!! Those are cute, thanks for the giveaway. It will be Christmas before you know it! That fabric is really cute-thanks! This fabric remeinds me of my mother who lived to be 89 years old. COMMENT! Will that do? I'm just kidding. This is the first time I have visited your blog and I am impressed. Love the "how to's" section and I will be visiting it often. Wishing you a wonderful evening and a better tomorrow. Love to win the fabrics. So cute. I'm always so jealous when you southern hemisphere folk are saying it's spring when we're descending into autumn here... Maybe I'll have to start migrating like a bird and have constant summer ;) Thanks for the chance, this fabric is so cute! I have a stash of fabric and WILL NOT buy any more but winning is OK! I'm finally recovered from the fun excitement of my son's wedding recently..!! I still can't believe my kids are grown and I'm a grandma.. Thanks for this generous giveaway..!! I have been cross stitching for over 30years and still love it. Lovely cute print! Thanks for the giveaway. I know! I can't believe we are in the middle of September! Would love to win these fabrics! Oh those fat quarters are so cute! Love them!! Thanks for the giveaway, I would love to make a pillow cover. I've seen this type of print on fabric, but never tried cross stitching on fabric. Love to try. 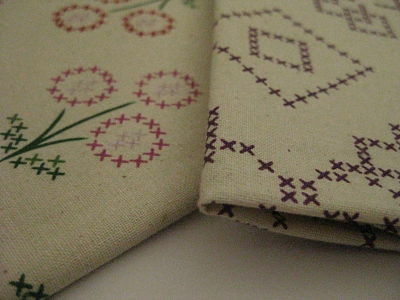 I just adore fabrics with a cross stitch print on them - I always try to stock up on them when I can get them. Thanks for the lovely giveaway. What wonderful fabric, thank you so much for the giveaway. What cute fabric: cross stitch without all the work! Thanks for the chance to win this pretty fabric. It would be nice made into a table scarf as a Christmas present for my SIL. I love your pretty fabric! I am watching the leave here drop more each day as we head into Fall. Schools been in for over a month hard to believe how fast time flys! Thanks! Love the fabric! No need to cross stitch by hand but you could if you wanted something to stand out. Nice! Thanks for the giveaway! Wow--it's not often I see fabric that I've never seen anywhere else, but these are new to me. So sweet. Super cute fabric! Thank you for the giveaway! super cute fabric! this year has gone so fast!